The big news for this year is Halinka’s win of the coveted Glover Prize with her work ‘Ponies’. The award was judged by a highly esteemed panel of Tony Stephens, Natalia Ottelenghi-Bradshaw and Jane Deeth who unanimously chose the work as the winner. Halinka’s work ‘In the Wild’ has been selected as a finalist in this year’s Sunshine Coast Art Prize. The Sunshine Coast Art Prize is an annual prize for contemporary two dimensional art held at Caloundra Regional Gallery. The prize will run from the 16th of August till the 14th of October. The winner will be announced on the 30th of August. An interview with Varia Karipoff will be published in the July/August print edition of Art Guide magazine. Halinka will be having a solo show with Flinders Street Gallery in Sydney in early October. 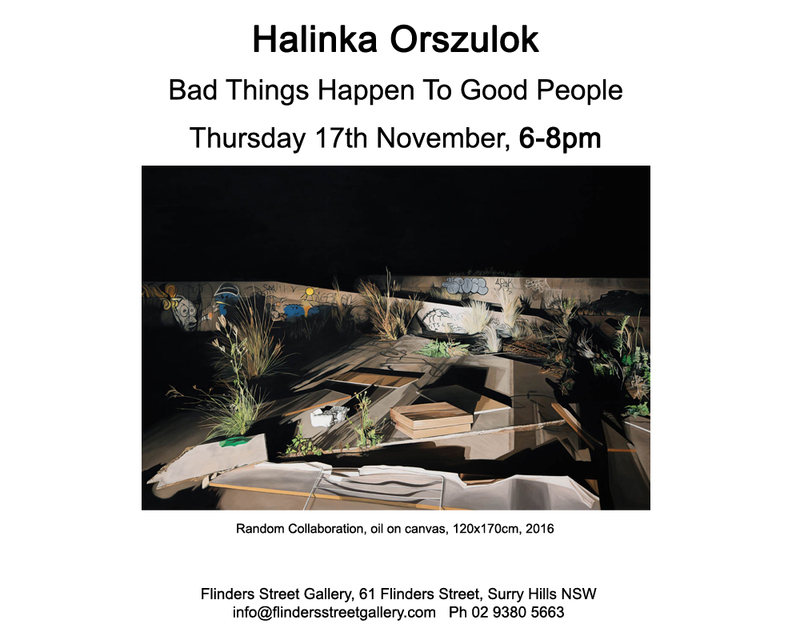 Halinka’s new show opens at Flinders Street Gallery on Thursday 17th November 2016, from 6 – 8pm. The show will run from Wednesday 16th November until Wednesday 8th December at Flinders Street Gallery, 61 Flinders Street, Sydney, Australia 2010. You can contact Jason Martin at the gallery on 02 9380 5663. The official invite is below – click for a larger version. You can read Halinka’s artist’s statement about the show here. There’s a Facebook event with details which you can join here. Click here to go to the Gallery page to see the new work. My new show opens on Thursday 3rd September, from 6 – 8pm. Please come along and pass the information on to anyone who you think might be interested. Show runs from the 2nd to the 26th September. All the details on the invite below – click for a larger version. Images of the new work are available on the gallery website at http://www.flindersstreetgallery.com, and will be up in the gallery here after the show. My latest body of work reflects an interest in how the changes we make to the environment in turn affect the way we relate to the spaces we inhabit and pass through. We divide and design space for human purpose and internalise these constructions in order to psychologically map our sense of place in the world. In this way, the external environment becomes a mirror for the internal, individual space of the subconscious, allowing these images to be read in a metaphorical or narrative sense. The paintings are based on photographs taken in two different locations near the town of Kiama. The first is a section of old highway that once took traffic through town where, particularly at night, there can be a feeling of desolation and unnatural quiet. I was fascinated by the starkly lit embankment, a weedy wilderness cut out of the rock to accommodate the road; it is ground not meant to be walked over, only seen from the window of a moving vehicle. Here the conventional binary between the natural and man-made environment breaks down. This distinction is uncomfortably merged as plants, some native but mostly weed, have firmly established themselves on the rock-face which crumbles and erodes under the influences of time and the elements. The two paintings based on this location (‘Lone Rider’, ‘On the Ground’) will be shown later this year as part of my contribution to a crime themed group show ‘Exhibit A’, curated by Carrie Miller, at The Lockup in Newcastle. The second location I photographed is a bike path winding through dairy paddocks which are gradually being eaten up by suburban development. The path passes under two highway bridges which impose monumentally on the rural landscape. It is a strange feeling to be physically present in a space which, to others, is only a backdrop to their travel. The two types of experience are completely cut off from each other; the space above on the bridges and the landscape beneath seem to exist in different pockets of time. As modes of travel become increasingly efficient, there is an ongoing abstraction of the landscape into something that is passed through, not physically experienced. It is hard to fight a feeling of nostalgia, seeing a remnant rural idyll through the frame of a concrete monument to human progress. At the same time, there is a sense of awe when looking up at these incredible constructions, at what we humans can achieve. I am also interested in how these spaces, constructed for one purpose, might find another under the cover of darkness. As I put these images together there is the imagining of other people experiencing them and how they might feel. Outsiders finding solitude, camaraderie, danger, sadness or perhaps even elation, the darkness outside intensifying a connection to the inner self. My new show opens on Tuesday 29th April, from 6 – 8pm. Please come along and pass the information on to anyone who you think might be interested. Show runs from the 30th April to the 17th May. All the details on the invite at top left – click for a larger image. Images of the new work are available on the gallery website at http://www.flindersstreetgallery.com and will be up in the gallery here after the show. In the past, my work has expressed a fascination for built environments and how they reflect back to us both our physical and psychological inhabitation of them. I am particularly interested in the transformation of these spaces at night, how their meaning may be altered by the subconscious associations night carries with it; mystery, danger and the possibilities of the unknown. While out taking photographs for new work, I was lucky enough to stumble upon the aftermath of a joyride, which became the loose narrative focus for this current suite of paintings. The stillness of the spectacularly burnt out wreckage and the abstract patterns left by the ‘circle work’ told a story of intense energy and emotion that had been and passed. The skate park and adjoining car park becoming a stage for this performance. It seemed somehow appropriate that this marginal activity would occur in a kind of no-man’s land in the shadow of a large supermarket. This deliberately destructive, dangerous act expresses a refusal to conform to society’s expectations and conventions – whether driven by testosterone-fuelled anger, boredom or some other displaced energy, we can’t know for certain. Without condoning the activity, it’s still possible to be impressed by the sense of intense energy and life force concentrated there in the burnt out wreckage and the skilful mastery and simple beauty of the circles drawn by the car’s tyres. I imagine the people in that car carried away by a momentary sense of ownership and power over the landscape through which they passed and on which they left their mark. I’m very excited to be taking my work down to Melbourne for a show in the Purgatory Artspace, upstairs at Gallerysmith. In getting to know Marita Smith, the director at Gallerysmith, she has proven to be uncompromising in her commitment both to her artsists and to contemprary art in general so it’s a real pleasure to be showing in association with this gallery. The show will be open from Thursday 21st of March till Sunday 7th of April during the galleries usual opening times. There will be celebratory drinks on Sat 23rd of March, so please join us if you can. The time has come again to bring the solitary work of the studio out into the world. It would be great if you can join me for the opening night on the 20th Nov. If you can’t make the opening night, the show runs from the 21st Nov- 8th Dec. I will be present at the gallery 29th and 30th Nov, and giving an artist’s talk on the 1st Dec.
See below for the invitation (click the image for full size) and an artist’s statement. 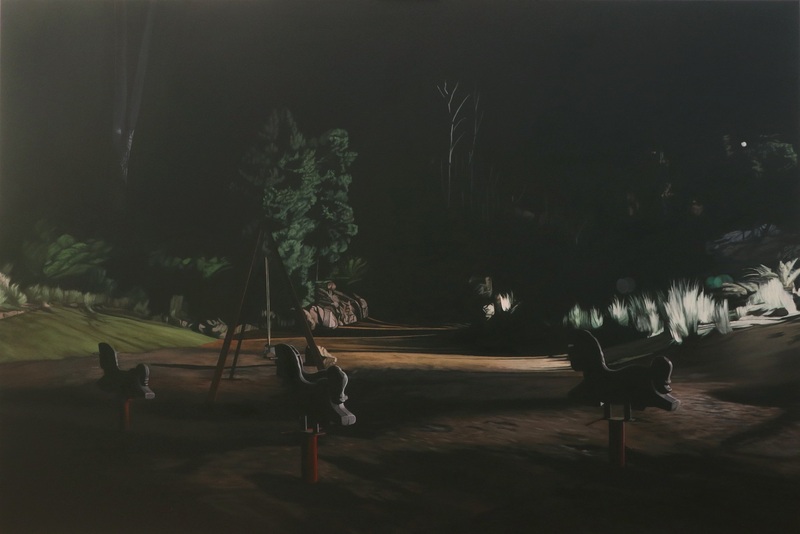 For my third solo exhibition with Flinders Street Gallery, I have continued my practice of taking photos at night and painting them photo-realistically in oil on canvas. The subject matter comes from locations near my home on the south coast and shows scenes around the towns of Kiama and Jamberoo. This has lent the images a slightly different tone to the more urban settings I often focused on in the past. There are greater areas of darkness and the natural world is a lot more present in these images. I have always been intrigued by the visual, almost surreal effect on natural elements when they are lit by artificial light at night. For me, this represents the fragile yet compelling imaginary line between the sphere of the human and that of the natural world. Illuminating public spaces at night is a practicality, but it also deepens the shadows, making the dark all the more impenetrable. In my work this contrast between what is seen and what is thrown into extreme darkness symbolises a failed attempt at control and ownership. It is a reminder that the traditional binary division between nature and culture, the wild and the tamed, the known and the unknown, the rational and the irrational, is a conventional one, though it remains potent in our minds. Artificial light in the night-time landscape is also a reminder that we play a dominant role in the shaping of our environment and that we must live with the changes we render. On another level, this contrast of light and darkness can be seen as symbolic of our fraught relationship with the known and the unknown within ourselves. My interest is firmly rooted in the subjective experience – how we psychologically locate ourselves in a world of flux where we are both active participant and subject to the many uncertainties of our existence. At times even our own internal world can seem out of our control, the only way to regain the self being through the darkest places within. We map our personal topographies across the landscape in which we move, giving the world form, purpose and meaning via our own memories and experiences. We make sense of the things that happen to us by building them into a unique personal narrative. Some look to religion, superstition or magical thinking to bolster a sense of agency in the face of so much uncertainty. It is also true that intense flashes of insight, a sense of everything being deeply meaningful, can be the result of intoxication or madness. These images represent moments of reflection and insight within an unknown greater narrative. By painting these otherwise overlooked spaces with such attention to detail my aim is to elicit a feeling of everything, however fleetingly, being meaningful. It is my belief that the physical act of painting and the very stillness of the images in some way manages to achieve this. I wish to explore the potential for the external world to be a mirror to one’s internal world and leave it to the viewer to decide what meaning lies there. For the Transmission show at Campbelltown Arts centre, artists were paired with musicians and asked over a relatively short period of time, with no distinct brief, to make something in collaboration. Co-curator Carrie Miller says that she felt her job was to bring the right people together, let them go for it creatively and be there to solve any problems that arose. This mutual trust and creative freedom reaped its rewards as is evidenced by a very strong show well worth the journey to Campbelltown, and I urge you to treat yourselves to a mind-boggling range of audio-visual delights. On Friday night I was there for the opening. It was cold in Campbelltown and entering the warm arts centre felt a bit like travelling through a portal into another world. Although the Transmission show is not curated with a distinct theme in mind, this sense of altered reality is something that flows through the show like a substance taken at a concert. After all, that is why many people are drawn to live music and performance, to experience a transcendental moment, to witness someone being conduit to something other as performer – and to themselves be part of something greater as audience. There are no words that can precisely sum up this experience but most people will at some point have experienced it and agree that it is a powerful and seductive one. Even in the works that weren’t live performance I felt that there was an emphasis on this relationship between minds, transmission, reception and altered reality. On the night, that suave crooner Renny Kodgers, complete with orange tan and large cowboy hat, interrupted the speeches to spread his unique brand of love. He did this with the help of the ‘Sweet Tonic Choir’, a group of older ladies and gentlemen who I believe are local to the Campbelltown area. I felt a moment of trepidation where I wondered what angle he would take, whether there would be a level of mockery which would have made me feel uncomfortable, but in fact he managed quite the opposite. He pulled it off with good humour, respect and sense of endearment for these people of another generation, whose tastes may seem anachronistic to a younger audience. It was a reminder of cultural and generational change and, if anything, fostered a sense of understanding between otherwise non-compatible worlds. It was quite sweet really. Kusum Normoyle delivered a visceral performance of primal sound created with her voice; she sounded like an enraged animal, alternately yelling into a microphone, making a purring, panting sound, and deliberately creating feedback with the speaker. The level of energy and the way she gave herself over to the performance was impressive and potentially confronting. It brought to mind the effect on an audience member at a heavy gig where the primal energy is a release from the constraints of everyday convention. Where conventionally more confronting and primal feelings are trapped inside to enable the smooth running of society, who hasn’t at some point wanted to go totally animalistic? The final performance on the night was from Justene Williams and Tina Havelock Stevens. What a mad cacophony of sights and sounds. So many references I’m sure I didn’t fully decipher but I was genuinely intrigued. What I did understand was the way in which, as performers, they became depersonalised in their karate uniforms, orange wigs and masks. In a sense, their performance was about all performances. They threw themselves into this role of conduit with a totally committed physicality. To me, there was something about the voodoo witch-doctor in the work, as though channelling the ‘other side’ through a sense of hypnotic and compelling ritual. Although I did not always understand in a rational sense, I think that was probably the point. It was more about being transported into a parallel place, I simply couldn’t look away and so became witness to something wild and other-worldly. One of the questions which came up for me in considering this show was: what are the defining differences between musicians and artists? (Sorry, there is no clever punch line here.) The answer at first glance is that musicians work with sound and performance and artists work with visual media – but as is evidenced by this show, these categories are in fact very interchangeable. After all, even a career musician will almost certainly have some involvement in visual decisions â€“ cover art, video clips and costume and set design. Conversely, as outlined in the description of the performances on the night, artists often inhabit territory one might assume is the realm of the musician. We do sometimes simply call them all artists though it’s true categories can make things easier to talk about. A good example of this crossing over was seen in Rachel Scott’s video collaboration with Mick Harvey. He provided the atmospheric soundtrack but also some video footage shown alongside Rachel’s. There was an emotional undercurrent pulling one into this work featuring a lone female figure adrift in the night. Another artist/musician combination took the more familiar form of a music video clip with the song a launching point for the visuals. Daniel Mudie Cunningham’s collaboration with Stephen Allkins, ‘Boytown’, is a beautifully executed ode to gay culture and the 80s. It uses the background of the Bronski Beat song ‘Smalltown Boy’ and pieces together a simultaneously poignant and self-referential narrative. It treads this line so carefully that neither meaning is lost. It brings to mind the way friends might share painful truths about themselves, particularly when young, hiding the rawness behind a little self-deprecation and parody. So if they’re all simply artists, all I can do is tell you, in my humble opinion, what an artist is; someone who has a life-long commitment to their process and is able to incorporate personal experience and thoughtful interrogation into their work in an ever-evolving way. It is wonderful to see such talented artists feeding the fires of each others’ practice and I, like so many raving about the show on the night, thoroughly enjoyed it. Last night I attended the opening of the Redlands Westpac Art Prize held at its new and brilliant venue, the National Art School Galleries. The atmosphere was vibrant and upbeat and the speeches left me feeling a warm glow for the sense of camaraderie that the art prize this year is designed to engender but a few nagging doubts left me with mixed feelings. I have a new work in the first show of 2012 for Flinders Street Gallery. The Show has a ‘tonal’ theme, so black and white or work that is mostly centred around using tone. The opening night will be held on Tuesday the 7th of Feb from 6-8pm. 61 Flinders Street, Surry Hills. There is also a solo show penciled in for October this year…I will be sure to post more about that when the date is set. Sorry about the problems – the menu tabs are now back at the top of this page.